Albert E. Cowdrey. Inside Story. Retired Detective Sergeant Alphonse Fournet finds the lure of work, post-Katrina, too much to resist, when he finds out that people are continuing to mysteriously disappear. He is rapidly confronted with those of an alien persuasion who have been doing the abducting-humans thing, and as a representative of Bush the Second (heaven help us!) he has to put things right. You would have thought being resurrected and given immortality would be to be welcomed. However, one man who is presented with this opportunity (he had no say in it as he was already dead) is not exactly enamoured of his predicament, especially as he now no longer needs sleep, and all he craves is the chance to sleep, perchance to dream. Geoff Ryman. Days of Wonder. A strong story from Ryman, with an intriguing setting, the background to which is gradually explained. The main character is Leveza, a young mare, part of a pack of horses who are migrating, in fear of the predatory big cats who are tracking them. The horses have a number of human traits, and in foaling, Leveza gives birth to a horse which is more human than most. As the migration takes place, Leveza’s infant falls prey to the cats, and there is some complex interplay between her, her companions, and a cat which is captured. We find out the whys and wherefores : humanity, seeming an imminent collapse which they will not survive, encodes elements of humanity in each of the birds and beasts, in the hope that at some points those discrete, embedded elements may be re-combined. Stephen King. The New York Times at Special Bargain Rates. A masterful piece from a master : a young widow is grieving her recently lost husband, killed in a plane crash. However, she gets a phone call from her husband, who is able to speak to her through some quirk in the fabric of time, and he is able to pass on some advice in the few minutes they have left together. Scott Bradfield. Dazzle Joins the Screenwriters’ Guild. More gentle humour featuring Dazzle the talking (and writing) dog. Subtle story in which an aspiring SF writer finds that some of his stories which are not being accepted by the usual sources, are of interest to a well-known author, who buys the story – not to publish, but to keep secret the ideas contained therein. Laurel Winter. Going Back in Time. Short in which a quantum theory and metaphysics students is able to get the girl, time and time again, or not. A satirical take on western society’s increasingly voyeuristic/exhibitionist tendencies, as a young man who earns money by being a conduit to others who observe that which he observers, becomes obsessed with a young woman who can go just so far in making herself available. Emshwiller first appeared in F&SF four years before I was born, which is pretty impressive, especially as she continues to write with a freshness of idea and lightness of touch that can often disappear over time. A young women finds herself in a strange place, a strange time, and a strange body. Is she on the run frome someone, and if so, whom? Friendship in the shape of a bookstore owner offers her a chance to make a fresh start, but when her old life makes a violent entrance into her new one, choices have to be made. An emotionally draining story. Set in a near future USA, in which the anti-abortion lobby have very much got their way. Women who have had abortions are criminalised, and there are public executions, described in disturbing detail, in which the community comes together to celebrate justice being seen to be done. More of an Analog-y type of science fiction than you normally get in F&SF as a team of two unsuited spacesuited scientists find them in a very anomalous situation, with an arachnid alien problem thrown in. In getting back to (a) base alone, one scientist is given the opportunity of being a bit more of a colleague to her erstwhile/future colleague once again/this time around. Michael Swanwick. The Scarecrow’s Boy. A tardis of a story – much bigger on the inside than on the outside. A young boy stumbles, crying, into a field, and the robot acting as a scarecrow could be his once chance of staying alive. But for that to happen, the robot has to justify actions that would go against its programming. 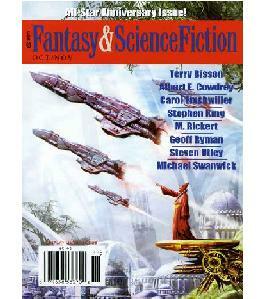 A double-issue 2All-Star Anniversary Issue!” with a goodly collection of fiction. Some re-appearances of F&SF regulars who like to see such regular appearances, as well as some top quality stuff, with Rickert and Ryman pulling out the stops in terms of imagination.